Cullompton is a small service area signed only from the northbound side so as not to overload the junction. Southbound traffic can access it from J28 just like northbound. First two hours free for all vehicles, after which you must pay £25 per 24 hour period. The small site has little in the way of outdoor facilities. Cullompton is a very small service area built on land acquired by Margram, who leased the facilities out to BP and McDonald's. McDonald's were signed as the site owners and therefore technically the operator. Additional, unrelated, "local facilities" are signed from the junction. The filling station is operated by Shell. The service area was planned in 1993 and again in 1996, while plans were also considered at Willand. When it was built it was suggested the amenity building would house a "second food offer" - in 2001 this materialised as a Little Chef ran by Moto. It was built on the site of an old railway station yard. Space was left for a rail-stop facility to be added to the site, a plan which was eventually dropped in favour of more car parking. When it was built, signs were added to the M5 northbound to direct them to the services. 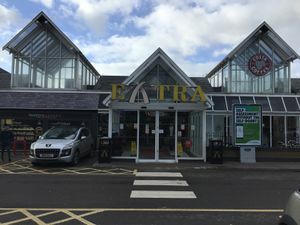 The Highways Agency refused to sign the southbound services as there weren't enough parking spaces (at 143), in addition to the fact that the motorway interchange wasn't particularly high-capacity. When the services opened there were several attempts to add totem poles to the site, which the Highways Agency described as a "disappointing" effort to unofficially attract southbound motorists. In 2003, Margram sold their sites to Extra, who have slowly introduced their portfolio of franchises and branding. 10 years later, its branding looked the same as any other Extra site. In 2004 the Little Chef became LP4, and in April 2012 it became a Costa ran again by Moto. The BP garage transferred to Shell in 2008, like all other Extra forecourts. 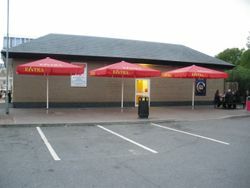 A 2010 refurbishment saw the toilet block moved from the entrance to the back to allow a new WHSmith to open, in addition to a side-entrance to the back of the car park. Warren's Bakery, a Cornwall-based bakery, was introduced to the services on 26 May 2015. The services came last in Holiday Which? Magazine's survey in 2006, as they said it was "little more than a McDonald's next to a petrol station", and it had un-flushed toilets with broken seats and broken locks. But Cullompton argued back, as reported on BBC News. In August 2011, VisitEngland rated the services as 2 stars, making it one of the worst-rated.